About 69,000 gilets jaunes (yellow vests) marched across France on Saturday, including 4,000 in Paris, according to the French Interior ministry. This was the movement's eleventh consecutive week of protests, dubbed "act XI", despite divisions emerging in their ranks. Despite the French President Emmanuel Macron and his government's ratings increasing in recent weeks, the "great national debate" the president launched to start a dialogue with the gilets jaunes is not convincing many of them. Internal fights within the movement have also multiplied. Two vocal gilets jaunes figures, Éric Drouet and Priscillia Ludosky, announced they would not cooperate any longer. The creation of a gilets jaunes list for the European elections announced on Wednesday by Ingrid Levavasseur et Hayk Shahinyan has also been met with criticism. Saturday's "Act XI" is aimed at uniting the movement and developing new strategies. In Paris, there were four authorised protests heading from the Champs-Élysées to the Place de la Bastille, as well as a march of solidarity "for the gilets jaunes in overseas territories". Éric Drouet, a prominent gilets jaunes leader, told reporters at one of the Paris marches: "We know that [the government] doesn't want to listen to us and that they're doing the great debate to play for time." "The great debate is mostly a great mascarade," Mathieu Styrna, a 36-year-old carpenter from northern France, told the AFP. "It seems like the people are selected to participate," he said, adding that with spring around the corner, and with all the mobilisation this winter, the movement was only beginning. 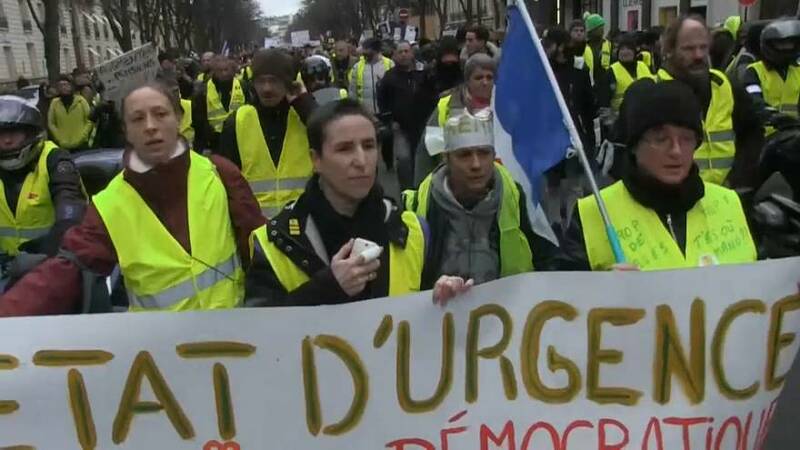 Gilets jaunes also mobilised themselves in other cities across France. In Strasbourg, between 200 and 300 protesters met at the European Parliament before walking to the city centre. Protesters in Montpellier, in southern France, and Evreux in Normandy, started demonstrating around 10 a.m. on Saturday morning. They were 5,000 in Bordeaux, several thousands in Toulouse, at least 2,000 in Nantes and about 4,000 in Marseille. In Paris, police and protesters exchanged tear gas and projectiles. Jerome Rodrigues, a gilet jaune figure close to influential Drouet, was severely injured in the eye. He filmed the scene live on Facebook. The French Interior minister Christophe Castaner has condemned "the violence and degradations committed" in Paris and across the country by "troublemakers wearing yellow vests". He added that IGPN, the French 'police of the police', would investigate the "events on the Bastille", which include Rodrigues' injury. Protesters were invited to participate to a 'yellow night' from 5 p.m. to 10 p.m. on Paris' Place de la Republique, which already hosted the 'Nuit Debout' ('Up all night') movement in 2016. Éric Drouet was among those calling for the 'yellow night' to happen. Several night marches were also planned across France. Participants at the 'yellow night' in Paris were forced to leave early after police arrived to clear the Place de la Republique around 7 PM. On Sunday, critics of the gilets jaunes, called the "red scarves", will meet up in Paris for a "republican march for the liberties" in which they want to defend "democracy and its institutions" and hope for "the silent majority" to be heard. On Saturday, for the first time, the French police will be wearing body cameras after the controversy around the LBD weapons used by police officers, which has harmed dozens of protesters in the past. Interior minister Christophe Castaner has announced the introduction of body cams to ensure "transparency" in the use of LBD weapons. Around 84.000 protesters participated in gilets jaunes marches in the past two weeks.